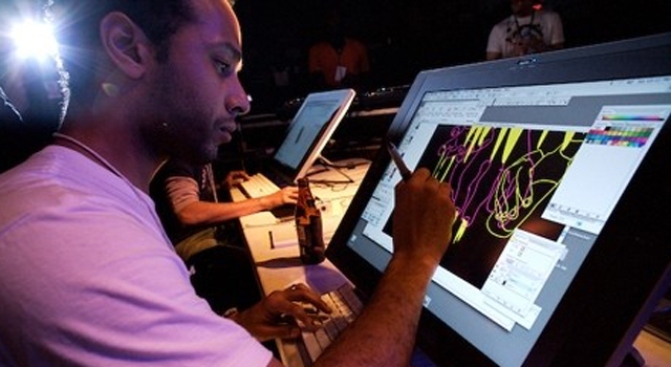 Contestants will put their design skills to the test at the 2008 C&P Digital Design Tournament. This Saturday night will have been a long time coming for a handful of the city's top designers, when they gather at Webster Hall for Cut&Paste's Digital Design Tournament here in Manhattan. After an intense selection process which included a call for competitors period and a weekend of test rounds performed in front of a small audience Cut&Paste insiders, eight of New York's best designers will compete in two rounds, each lasting 15 minutes, working to create the 2D, 3D and - new this year - an 8-hour marathon Motion Design competition. Everything the designers do is displayed in real-time as they work in front of the excitable crowds. They'll be balancing between crowd-pleasing acts of design and the nimble handwork required to dance around Cut&Paste's challenging creative briefs. The single winners of each competition will then move on to face fifteen other city champions in June's Global Championship, right here in New York City. Cut&Paste's Digital Design Tournament for New York takes place this Saturday night starting at 7:00 p.m. at Webster Hall on 11th Street. Tickets are $15 online and $20 at the door, with group discounts available on Cut&Paste's site. There will be booze so keep the kids at home, this event is for the 21 and older crowd. You can also buy Tickets at Going.com.